The Maltese journalist, famous for her fearless reporting on corporate and political corruption in Malta, was killed by a car bomb last week. 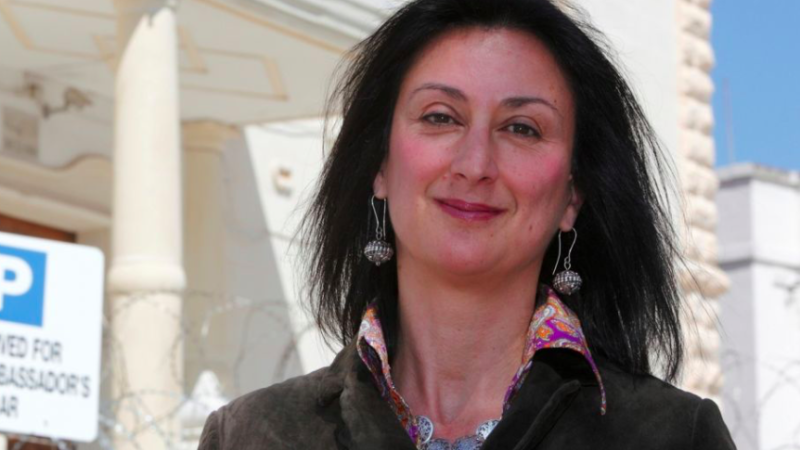 Last week, Maltese journalist Daphne Caruana Galizia, investigating the fallout from Panama Papers, was brutally assassinated. She repeatedly drew attention to how the nexus of political and corporate interests is destroying the possibilities of good lives for ordinary people. Her final written words were: “there are crooks everywhere you look. The situation is desperate”. Her assassination has hardly drawn any condemnation from western governments. He continued: “as a result of the war, corporations have been enthroned and an era of corruption in high places will follow, and the money power of the country will endeavour to prolong its reign by working upon the prejudices of the people until all wealth is aggregated in a few hands, and the Republic is destroyed”. The nightmare scenario that Galizia and Lincoln warned us about is now woven into the fabric of daily life. In major western countries, no one can easily fight elections without corporate money. The return to corporations for this investment is a central role in public policymaking and governments go easy on their misdemeanours. Major corporations have a history of toppling governments and collaboration with murderous regimes to advance their economic interests. Companies like Hewlett Packard admitted to using “slush fund for bribe payments, set up an intricate web of shell companies and bank accounts to launder money, employed two sets of books to track bribe recipients”. BAE has pleaded guilty to “knowingly and willfully making false statements” to advance its business interests. Companies affiliated with Coca-Cola have been accused of using illegal paramilitary groups to intimidate, threaten and kill workers seeking better rights. And who can forget the health and safety standards of Union Carbide, which led to the world’s worst industrial accident and may have killed nearly 16,000 people in India. The daily life of every household is affected by corporate abuses. Thousands of profitable companies fail to pay the statutory minimum wage. Tobacco companies knew long ago that their products were hazardous but chose to remain quiet. Too many newspapers have hacked people’s phones, and this eventually led to the demise of the News of the World. Drug companies overcharge the NHS by as much as 12,000%. Food and drinks companies mislead customers by wrapping worse versions of well-known goods in same packaging. Food manufacturers fiddled dates and repackaged meat which may not be suitable for human consumption. Some even sold horsemeat as beef to make higher profit. The above are just a sample, and the abuses are widespread. Despite the hype of codes on social responsibility no sector of the economy can be said to be upright or caring. The abuses are meticulously planned by highly educated people who are handsomely rewarded for their scams. An army of accountants, lawyers and advisors is always on hand to do their bidding. Fines on corporations and occasional prison sentences for some executives do not seem to have dampened enthusiasm to cheat and short change people. Too many entrepreneurs are willing to ‘bend the rules’ and make profits at almost any cost. They show little regard for the consequences for others. None of this is natural or inevitable as no one has ever identified any genetic structure which compels individuals to develop predatory business practices. Rather the nefarious practices are learnt and legitimised by financial rewards and the media often glamorises the trendy life style of the perpetrators. Investigative journalists like Daphne Caruana Galizia have long been the social conscience of society, but that too is under threat as corporate interests muzzle unwelcome investigation and analysis. The Daily Telegraph’s chief political commentator Peter Osborne resigned because the newspaper muzzled critical stories about HSBC and other large corporations. The dangers that Galizia and Lincoln warned us about require new thinking. Unchecked corporate power can’t deliver human satisfactions or happiness. Indeed, it now threatens so much, including the environment, earth’s scarce resources, the future of the human race, and even the survival of the planet. The choice is clear cut: we can have either democracy and public accountability or rampant corporate power with enormous private wealth and power concentrated in the hands of a few business executives, but not both. Prem Sikka is Emeritus Professor of Accounting at the University of Essex, and is a Contributing Editor for Left Foot Forward. In a bankruptcy case I know of, a solicitor who claimed to have got his qualifications in America, had a criminal record for fraud in the US, came to UK, got a licence to practice. The victim in another matter sought help from said solicitor who gave bad advice then doubled his bill. The client discovered this man’s record and reported it to the Law Society. The solicitor then threatened bankruptcy procedings unless the victim paid up £20k and dropped her complaint against him. The client offered the money but refused to drop the complaint to the LS. The solicitor forged the clients signature and other misdemeanours to get a BO. Obtaining a court order by fraud makes it a nullity. The trustees, rather than do their job and investigate and ask the court to reconsider the bankruptcy, set out on a rampage to disposses the victim using costs which the ramped up by challenging the victim instead of doing their job as trustees for the victims estate. The cost now stand at £1.7Million. Seven high court judges have said that the bankruptcy ought never to have been made, but all they are interested in is who pays the trustees costs. How contorted is the British legal system? Judges rely heavily on the word “discretion” as a means of not having to put things right even though the “discretion” is arbitrary, even contrary to law.